Dr. Sriram Rajagopal, Chief Scientific Officer & Head of Drug Discovery Research, is responsible for Integrated Drug Discovery Research and delivering on cutting edge Science. Dr. Sriram has 25 years of rich research experience with 16 years of experience in handling diverse aspects of drug discovery in Oncology / Diabetes / Anti-Bacterial both in the in-house Drug Discovery and CRO services. He has around 10 years of academic research experience at M.D Anderson Cancer center, Houston, Texas, USA. Beginning his Pharma career with Dr Reddys laboratories, he was also associated with Orchid Research Laboratories Ltd in his earlier career. 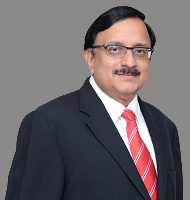 Prior to joining us he was associated with GVK BIO where he was responsible for building a strong biology team and worked closely with Chemistry Services to offer standalone services and integrated drug discovery to the current chemistry clients. He was also involved in supporting and building the required facility for collaborative drug discovery and new Biology service lines. Dr. Sriram has his Bachelor’s degree in chemistry from Madras University , he went on to complete his Masters in Biochemistry from JIPMER, Pondicherry. After being awarded the PhD degree in Biochemistry from Anna University, he did the post-doctoral research at University of Washington, Seattle and worked as junior faculty at MD Anderson Cancer Centre, Houston, Texas. He has 50 publications and 60 patents to his credit.